‘Tis the season to upload, play, and showcase your iRO story! Celebrate the festive season by creating your very own holiday-themed video! Who: Chaos, Thor, Loki, and Odin players! Where: Here - on WarpPortal Forums! 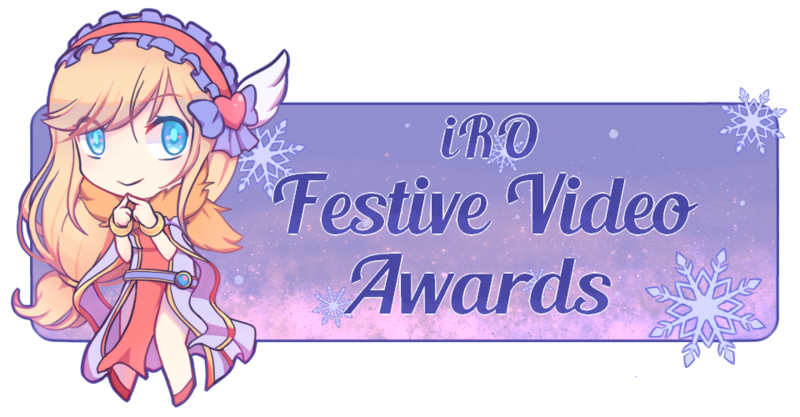 Submit a holiday-themed video about your RO adventures! It could be a music video, animation, musical, short film, trailer/teaser, instructional, or even a vlog! Theme: Your videos must be holiday-themed. It could be any festivity that falls around this time of the year and not exclusive to Christmas Season (e.g. Thanksgiving Day, Boxing Day, Christmas Day, New Year – you name it!). Your entry must contain iRO-related content only. Should there be narration and/or subtitles – they must be presented in English. Presentation: You may submit a replay, animation, photo slideshow, or a combination of all these. Should you wish to submit two entries, kindly submit them together in one response thread. Audience Favorite: Highest number of upvotes. However, entries upvoted through alt accounts will be disqualified. Best Storyline: Engage the audience with your plot... and plot twist! Most Romantic: Give us your best love story! It could be a romantic-comedy one, too! Judge Favorite: The spotlight is yours - so go ahead and impress the judges! Best Comedy: Laughter is the best medicine! Music Video of the Year: Your favorite song – and your iRO story! Yes, that’s a total of 10 winners! All entries will be judged by CM Astra and the rest of the WarpPortal Staff. Winner's Title will be given in-game, and can be equipped just like the rest of your titles from the Achievement System! Only available on Renewal and RE:START servers. Format & Quality: 720 QUALITY OR BETTER. Videos must be uploaded on YouTube during the duration of the event. Failure to comply may result in disqualification. Tick-tock: No strict time requirement. However, shorter videos tend to be better received by audiences. Originality: BE UNIQUE! Do not leech off someone else’s work. Anyone found to have plagiarized their submission is subject to disqualification. Quality & Creativity: RECYCLE BUT DO NOT REUSE! Regardless if it had won or not, please do not submit a video that you have submitted in previous events. Snippets of older footage may be used in your entry. However, the entry itself must be new and cannot consist entirely of old content. Etiquette, manners, and conduct: STAY CLASSY! Keep your submission free from passive-aggressive, gossip, slander, insulting, demeaning remarks, and any of the sort. Give credit where it is due: In case a commissioned art is included in the video submitted, kindly give credit where it is due. Same goes for the song used. Post reservation: Post reservation is not allowed and will be immediately removed by the VMods and the staff. Suitable for all audiences: Excessive violence, NSFW, profanity, sexual content, and the like are not accepted. Frequency: Maximum of 2 submissions per player. Please do not use any alt account(s) to submit more entries. Please be noted that submitting 2 entries increases your chance of winning. However, you are only able to win once. Q&A: If you need any clarifications regarding the contest, kindly send me or CM Astra a private message. Note: Breaching any of the rules listed above may result in disqualification with no second entry. Re-submission for an invalid entry is only permitted by the discretion of WarpPortal staff. CM Astra and Campitor for making this event possible! Edited by CMAstra, 28 December 2018 - 06:03 PM. Edited by pp322, 22 November 2018 - 06:27 AM. Also should kidna stop with the "most upvote" category, that's literally nothing but a "who has more friends on the forum" kinda thing and really has nothing to do with the event whatsoever, could make an event where everyone made blank posts and saw who got more upvotes, lol. Edited by KriticalAssassin, 15 November 2018 - 02:21 PM. It's from last years Got Talent event. Edited by Si6ers, 26 November 2018 - 01:34 PM. It's a really terrible way to judge but eh, not like this is new. Stephanie, would you mind giving us an example just like the previous contest so we all know where to start? Damn and here I am, thinking of handing red socks with chocolates and candies to peeps at Christmas. Guess will think of other ways then. Hi can do i something like real life crafting that is related to IRO theme holiday? This is a good event to boost creativity and all. To boost the population too? I vote for this awesome video! Edited by sylwen, 25 November 2018 - 08:49 AM. Edited by markopolong, 27 November 2018 - 01:26 PM. Edited by Newbi001, 19 December 2018 - 02:09 AM. Deadline's been extended until 25th December! Edited by Mekkubs, 30 December 2018 - 03:26 AM.